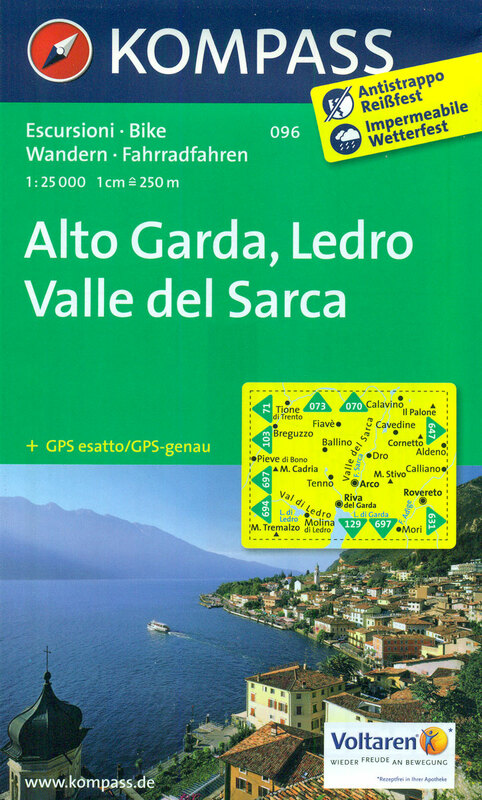 The area around and north of the northern tip of Lake Garda, including Riva del Garda, on a double-sided, waterproof and tear-resistant, contoured and GPS compatible map at 1:25,000 from Kompass. Contour interval is 20m, with extensive overprint for hiking trails, cycle routes including a selection of mountain bike routes), ski routes, accommodation and recreational facilities, local bus stops, etc. 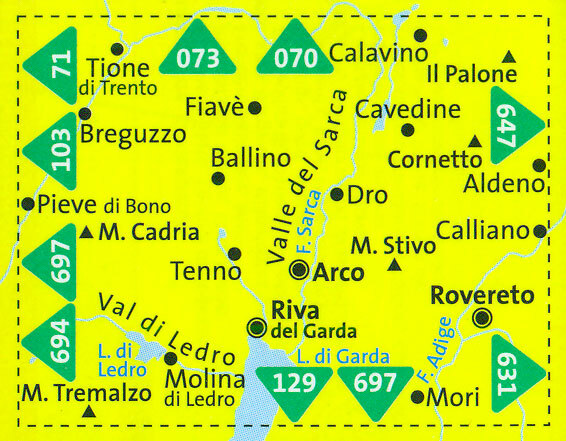 OTHER KOMPASS MAPS OF THE LAKE GARDA AREA: to see the list of Kompass maps in this series please click on the series link. 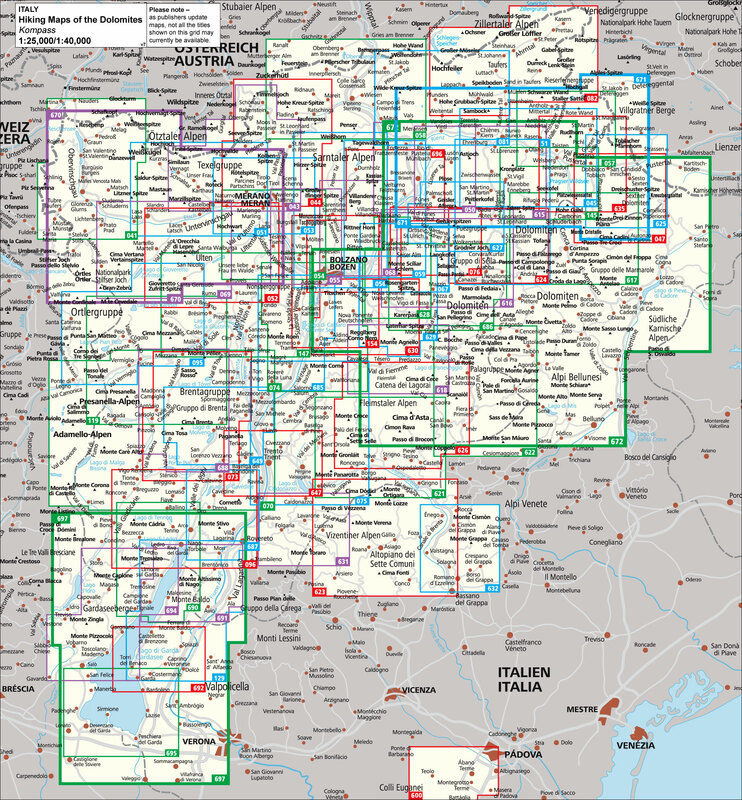 CARTOGRAPHY: Kompass maps of the Dolomites at 1:25,000 have contours at 20 or 25m intervals. An overprint shows local and long-distance footpaths, including all the high level routes (Alte Vie). 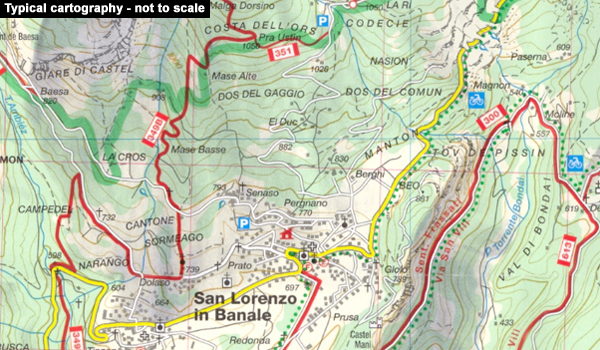 The maps also show the "via ferrata" paths along the iron rails and ladders fitted into the rock faces. Other information includes various types of accommodation (campsites, alpine huts and refuges, etc. ), recreational facilities, places of interest, local bus stops, etc. Many titles also have mountain bike trails or ski routes. Selected titles include on the reverse panorama drawings of the area, as indicated in the individual descriptions. GEOGRAPHICAL COORDINATES & MAP LEGEND: most maps are now GPS compatible, usually with a 1km UTM grid. Map legend includes English. 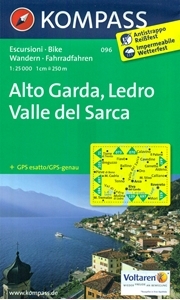 BOOKLETS - PLEASE NOTE BEFORE ORDERING - many titles come with booklets describing the area and/or various hiking routes. These booklets are in Italian and German only, apart from a handful of titles where an English language booklet is specifically indicated in the individual description. So, unless English language booklet is actually mentioned, the map can only be supplied with an Italian/German booklet. These booklets are not necessary to use the maps since, as stated above, full English language map legend is provided.